This approach is designed to make it possible to complete an ocean passage in the unlikely event of a drive line failure (albeit to a possibly different destination). 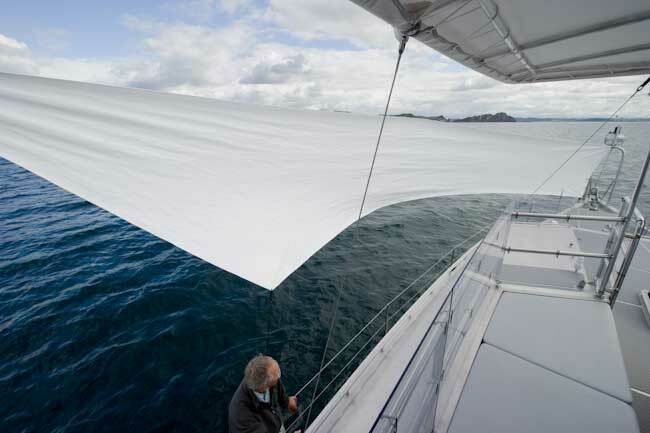 The “headsail” shown above is the result of real world testing. What you see is a protype. We’ll have a proper sail aboard soon and will update the photos. The sail now being made is 45 square meters/475 square feet in size, roller furls, and is set between the boom end and forward mast. Off the wind we expect to see 2.5 to 3.5 knots in moderate strength winds. This entry was posted on Sunday, October 16th, 2011 at 4:55 pm and is filed under Dashew Offshore, FPB 83. Both comments and pings are currently closed.